Author Lonnie M. E. Dunn’s newly released “Pumping Sunshine” is the story of how Bobbie’s friends find and rescue her after she is trapped in a cave. 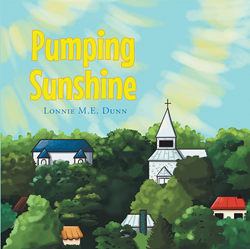 “Pumping Sunshine” from Christian Faith Publishing author Lonnie M. E. Dunn is the story of Bobbie and how her friends come together to rescue her after she is trapped in a cave. Bobbie’s friends finally find and save her by bringing together a town filled with all the people who love Bobbie. “Pumping Sunshine”: an epic rescue of a friend in need. “Pumping Sunshine” is the creation of published author, Lonnie M. E. Dunn, an unassuming nursing home resident who was given a story to tell by God Himself. Why was the sun so different today? What happened to Bobbie? Did her friends find her? What did people of the town of Christ Lake do? Published by Christian Faith Publishing, Lonnie M. E. Dunn’s new book tells the tale of friendship and a lost companion in need of rescue. Bobbie is a girl who has lots of friends and likes to volunteer at Christ Lake Mental Health facility. One day, her friends come to visit her at work. When no one knows where she went, Jane, Keith, Virginia, David, Audrey, and Lonnie rush off to find her. They soon discover she is trapped in a cave and needs the help of the entire town. View a synopsis of “Pumping Sunshine” on YouTube. Consumers can purchase“Pumping Sunshine” at traditional brick & mortar bookstores, or online at Amazon.com, Apple iTunes store, Kobo or Barnes and Noble. For additional information or inquiries about “Pumping Sunshine”, contact the Christian Faith Publishing media department at 866-554-0919.